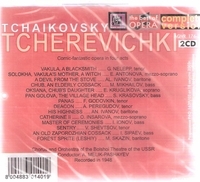 “The comic opera CHEREVICHKI was initially named VAKULA THE SMITH. In 1874, Tchaikovsky won a competition announced by the Russian Music Society for the best opera to a libretto by Yakov Polonsky based on the famous story CHRISTMAS EVE by Nikolai Gogol from his collection EVENINGS ON A FARM NEAR DIKANKA. However, Tchaikovsky was left displeased with his piece and reworked it in 1887. The opera was then staged at the Bolshoi Theatre, and the first night of CHEREVICHKI became Tchaikovsky's début as a conductor. Gogol was one of Tchaikovsky's favourite authors. The composer liked to rest in the Ukraine, in his sister's manor Kamenka. Tchaikovsky rendered the world of characters from Gogol's story, their lives, legends and emotions with the help of folk tunes, dance rhythms and expressive lyric intonations. The opera also has a gallant intermezzo - the scene at St. Petersburg court in the 18th century which also attracted the composer in a later opera THE QUEEN OF SPADES. “CHEREVICHKI (The Little Shoes, The Tsarina's Slippers, Les caprices d'Oxane, and Gli Stivaletti] is a comic-fantastic opera by Pyotr Ilyich Tchaikovsky. It was composed in 1885 in Maidanovo, Russia. The libretto was written by Yakov Polonsky, and is based on the story CHRISTMAS EVE, part of a collection called EVENINGS ON A FARM NEAR DIKANKA, by Nikolai Gogol. The opera is a revision of Tchaikovsky's earlier opera VAKULA THE SMITH. The work was first performed in 1887 in Moscow.